Coaching Soccer in Canada: What does "The Golden Rule" have to do with coaching youth soccer? one-sided. You are forced to govern your own emotions and assess the other party before engaging them. When you respect the other half of the discussion they are left with two options; respect you back or look silly while attacking. The Golden Rule has often been credited to Jesus, but it's present in the Old Testament (Tobit 4:15, Sirach 31:15) as well as documents from many other faiths. In my opinion, The Golden Rule is not religious so much as it is social and logical in terms of being productive and building relationships. "When did it become OK for our interpersonal conduct at sport to be on a lower level than the rest of our day?" It's not based on religion, but rather your own values. The Golden Rule is universally applicable. But let's be honest ... it's very human to find it very difficult to apply this at all times. I know I struggle to apply it 24/7/365. I try and I hope to have the wisdom to apply it, but emotions cloud things sometimes and off you go. I like to think I am relatively consistent with it, but not perfect. You are coaching an 8 year old girl. If you are the 8 year old girl, how would you like ot be treated? To execute The Golden Rule, you need to put yourself in their shoes before speaking. Same with parents, officials, club executives. 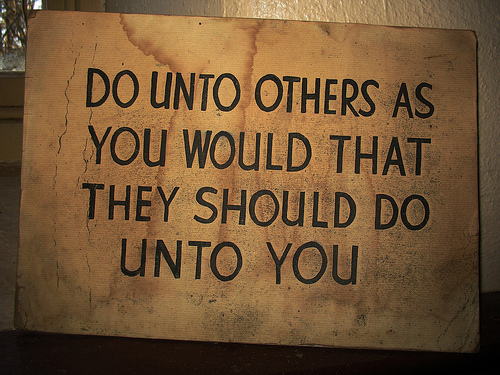 And, conversely, they would hopefully use The Golden Rule as a guideline in dealing with you. The good news is that living/coaching by The Golden Rule will make your coaching life easier. The bad news is the people you are dealing with may not subscribe to the same philosophy, but it is still better for you to operate from the high ground. You are committed to setting a good example for your players and the other party's mandate should not affect your behaviour. Easier said than done. I know that , but as a coach you have to strive to be above the noise. If somebody doesn't apply the Golden Rule in dealing with you, you may have to turn the other cheek to keep yourself in check. Even in a heated situation where you don't appreciate how you are being treated, applying The Golden Rule will keep you on the good side of the issue. There are 2 possible negatives to The Golden Rule. A person who has mastered the art of empathy can skillfully use it to manipulate people. Slippery salespeople and good con-men use empathy and may even disguise their actions as being under the umbrella of The Golden Rule. On a sports level, it might be seen by deceitful coaches in recruiting and/or releasing players, abuse, acquiring sponsors, etc. What if the person is accustomed to being treated poorly and has grown to accept it as the norm? If he expects to be treated poorly and applies the Golden Rule, he will not notice he is treating you poorly. Remember, the standard is set by the person's own values. If you are worried about whether your own personal values have been damaged by previous experiences, you can look to a higher source so you are no longer the standard for your behaviour. You can aim for this; (John 13:34) "A new command I give you: Love one another. As I have loved you, so you must love one another." There may be people in your life that you respect and they might be the standard you set for yourself. Maybe a motto of some kind. You might use Rotary International's Four-Way Test as a guide post. A vision or mission statement for your program may serve as a framework for everybody to structure their discussions and/or behaviour around. I am going to assume you get my point and move on. "The Golden Rule is universally applicable." This may all sound very non-sporty to the reader, and that's OK. But if you've ever been in a position of having to oversee coaches and deal with team problems, the issues have nothing to do with soccer and everything to do with damaged relationships and poor communication. In summary, you never lose when you sincerely treat players and parents as you would have them treat you. It may require you to take the long way towards a goal or do without something on the short term, but your actions will always be defensible and you will be respected as a coach, and a person.